The only noble thing a man can do with money is to build a schooner. Our goal is to provide an online nautical marketplace that is a resource for traditional methods, materials and tools while providing an affordable venue for small businesses and individuals including seafaring adventurers, as well as organizations--including boat clubs and nautical causes--to sell their own branded wares. 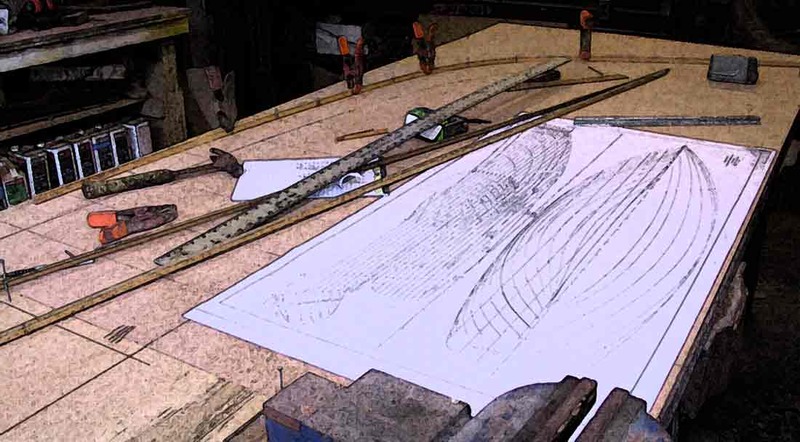 The Schooner Chandlery came into being because we saw a need and an opportunity to connect the makers who provide a diversity of unique services and wares to the people who need them -- including those who want vintage or historic methods and materials for their vessel. Everywhere, these small businesses and craftsmen are important to conserving and restoring historic vessels and structures. The Schooner Chandlery marketplace increases the opportunity for the general public to find unique makers and it enables makers to connect directly with their customers near and far. We do this as a nautical online shopping site where you can browse and buy directly from the makers: nautical small businesses, artists, craftsmen, and service providers. Here, you can find supplies for your new or classic boat; branded items from historic ships and other nautical causes; as well as wares from today's sailing explorers. The word "schooner" evokes thoughts of history, heritage, ventures and adventure. What comes to your mind? The world's trade routes, treasure maps, noonsights, and sextants? Privateers and the Revolutionary War? Fortunes that were made and lost with trade as well as the fleets of fishing schooners of the North Atlantic and the lumber schooners of the Pacific Northwest? The campaigns of great racing schooners or the original America's Cup? Perhaps high latitude adventures with glaciers in view or even peaceful and secluded Caribbean and South Pacific anchorages of coral and sandy beaches? We are Brenda Hattery and David Hattery. Enchanted with history and the natural world around us. Preferred lifestyle is seafaring adventure aboard our historic schooner. Preferred scene is a peaceful anchorage in the middle of nowhere–with high speed Internet access via a convenient hill-top tower nearby. We are lovers of technology, entrepreneurship, and strong communities. We engage in historic preservation via professional, volunteer, and personal efforts to conserve and restore the historic elements around us–be it buildings, open space conservation, or restoring the architectural elements of our homes. Our present home is a 1931 schooner that we took a few years off from other things to restore and sail. During our schooner rebuild, we benefited from the direct technical advice of three maritime museums and resources of four yachting organizations. We also learned necessary skills from visiting numerous historic ships, museums, and traditional boat-centric events. In addition to the need of specialized craftsmen and materials, we recognize the importance of these kinds of organizations to the successful restoration and sailing of traditional boats. Sailing our schooner in majestic estuary, coastal, and ocean environments including the World Heritage Site of Glacier Bay National Park, we have become increasingly aware of the impact of the industrial world on the ocean environment. We know resources are scarce for those who are endeavoring to save and operate nautical treasures like historic boats, ships, waterfronts, as well as those who try to protect the ocean environment we travel. Many volunteer-based organizations including historic ships, maritime museums, conservation groups, or boating organizations are very small and outside the direct view of their potential supporters -- The Schooner Chandlery platform enables nautical causes to increase their visibility and can provide a new venue for them to connect with supporters. Today's sailing explorations and ocean-based adventures are diverse. Many impressive ocean adventures and racing campaigns are undertaken on shoestring budgets with simple determination and no fanfare. They just do it. Many of these seafarers are artists, writers, and makers who are simply supporting their travels with their talents. The Schooner Chandlery provides a convenient gathering place for these adventurers' nautically-themed wares all in one place. Visitors can buy directly from a seafaring adventurer in our Schooner Chandlery marketplace. Maybe you're a maritime museum? sailing club, ocean conservation group? or perhaps undertaking an epic ocean adventure? You can create an online store for your cause! Give your organization the opportunity to gain sponsors and to make money 24/7. No matter where you are -- it's time to show the world your incredible talent with your own Schooner Chandlery storefront! Consider the search for your online gallery over! Need a web presence that’s affordable & can increase exposure for your new brand? Become part of the Schooner Chandlery marketplace today! Team up with Schooner Chandlery to promote your services! There’s nothing better than good word of mouth. Let’s make you the talk of the dock by listing your services online.